The kids loved writing their calligrams so I thought it would be fun to extend that into some more creative lettering. I was looking for lettering ideas / examples that I could do with my daughter when I spotted this book Creative Lettering for Kids: Techniques and Tips from Top Artists so I asked if we could test it out. The book is filled with lettering ideas that are totally manageable. My daughter can page through the book, find a page she likes and she can try out the idea herself and she can manage them. Okay her results will not look exactly like the photos in the book but she is able to get achieve something similar and her results are close enough that she feels proud. (I feel very strongly about kids art books that look stunning but contain activities that are not manageable for the kids. I think it can squash a kids creativity). Don’t get me lettering ideas are stunning, you get lovely results but the most important part for me is the kids can actually recreate these ideas. And most of the ideas use art items you probably have at home – watercolour paints, heavy paper, pens and pencils. And if you don’t have the exact item you can probably get away with trying something else. In the one activity they used gel pens and we used our Sharpies instead and my daughter was still happy with the results. We have tried numerous ideas from the book, sometimes copying everything exactly, sometimes taking inspiration from the book and adapting it in our own way. Every time we have been happy with the results. And my daughter is still eager to try more ideas from the book. 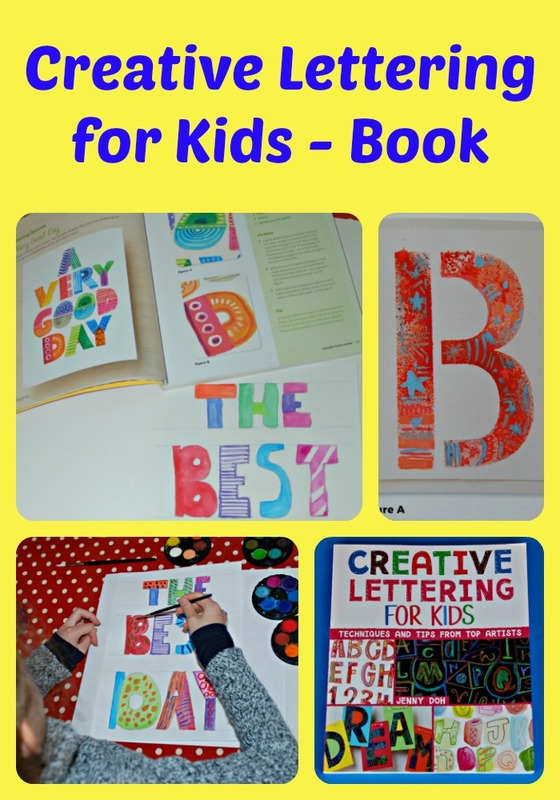 It is a great art book for kids but it is also a fun way to get kids writing, trying out different styles and getting creative with letters and words. The book encourages the kids to see words in a creative light and have fun with them. Whether you are using your paints or your pencils, whether you are writing chunky letters or curvy cursive letters it does not matter the kids can let their imaginations go and just have some fun. My daughter likes the book because it has given her some fun ideas and ideas that she can manage. I like the book because it turns words into something creative and the more fun my kids have creating words and writing the more the kids will want to write. We have only be using this book for a few weeks but we think it is a great addition to our creative book collection. Both my daughter and I love it. (In case anyone is wondering about ages my daughter is 9). As I mentioned above I approached the publishers and asked if we could review this book. This entry was posted in Homeschooling and tagged Art ideas, Book Ideas, children's art, Creative lettering, home education, homeschooling. Bookmark the permalink. What a fun and creative book! Love the idea of creative lettering.